A special non staining super concentrated portable rest room deodorant. This product contains the dye, perfume, and deodorizer package in one. 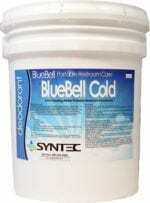 This product is extremely effective in portable toilets and portable rest rooms. Will keep odors down while providing a fresh scent during the warmest months. Long lasting and effective in almost any conditions. Available in Cherry, Bubble Gum, SpiceBerry, Cinnamon, and Orange Blast, and Wintermint fragrances.